This guidebook is both for those planning a longer birdwatching trip to Poland and for those visiting bigger cities for business, with only a few hours or half a day to spare for birdwatching for whom are described in more detail the sites in Warsaw and Kraków - the two cities probably most often visited by foreigners. Also includes descriptions of sites near other cities, such as Łódź, Poznań, Wrocław, Gdańsk, Białystok, Bydgoszcz, Lublin and Rzeszów. The authors are 46 ornithologists, birdwatchers, and local avifauna experts from Poland. The volume provides a description of 119 sites and 164 maps. It includes such famous sites as the Białowieża Forest, the Biebrza River Valley and the Warta River Mouth, but also other sites, probably unknown but definitely worth visiting. 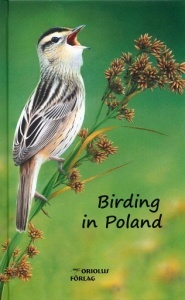 The book also includes a general description of avifauna in Poland, practical tips on birdwatching and travelling around, a chapter on the legal aspects of birdwatching and two articles on Aquatic Warbler and White Stork, as well as photos of typical habitats and a checklist of the birds of Poland. Text in English. 590 pages with text and maps and 20 pages with colour photos of different habitats.